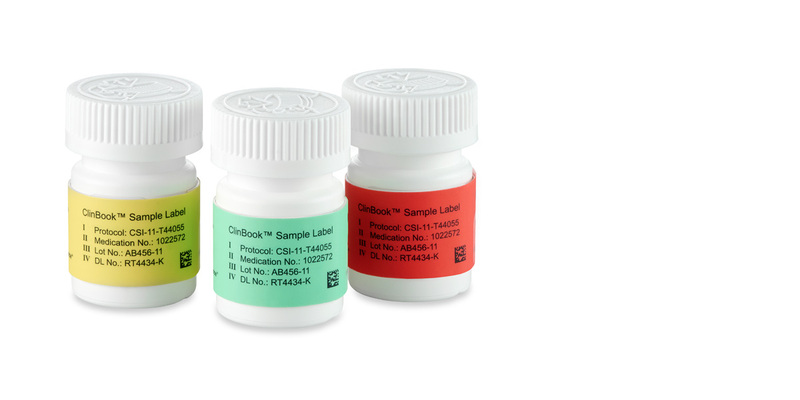 Clinical Booklet Labels are used when conducting global clinical trials where flexibility to distribute the clinical supplies to a range of international locations is necessary. This is accomplished by creating a booklet of pages that contain label text for multiple languages, positioned inside a reseal-able cover. The clinical booklet labels can then be adhered to various packages for multinational trials. The labels are designed in several different configurations dependent upon the clinical dispenser or layer of packaging they are being applied to. All our booklet labels can be opened and resealed to gain access to the data on the individual pages when required. 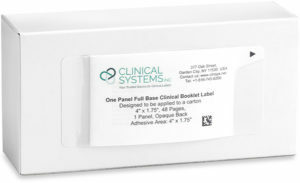 Clinical Systems booklet labels are state-of-the-art in design, manufacture and production utilizing the highest quality labeling materials and are computer generated in our GMP facility. Full Base Labels are designed for use on flat surfaces including cartons, kits and cards. 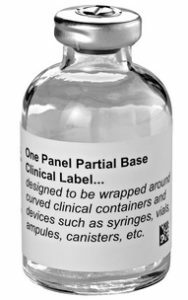 Partial Base Labels are designed for use with cylindrical clinical containers such as bottles, vials, canisters and syringes. Wrap Around Labels are similar to partial base labels but they are designed as 2 page designs to replace the need for flag labels. Like regular Partial Base Labels, these labels can be wrapped around onto themselves for use with small circumference containers. 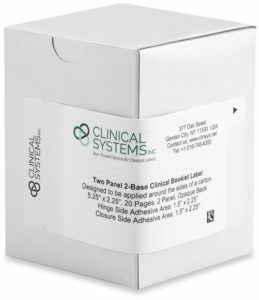 2-Base Clinical Booklet Labels are used when it is necessary to wrap a booklet label around one or more edges of a box or carton. It is important to have all the packaging component dimensions when designing this type of label. Bases are available in white, opaque or clear. White label bases are used for labeling new blank components. Opaque base labels can be used to cover up existing materials or other data such as pre-stamped lot information. Clear base labels are used when it is necessary to see into the container to use the product. The picture of the vial is of a clear base label. Multiple removable panels with adhesive backing can also be incorporated into all of the booklet label designs. These panels can be used to verify drug usage in case books or document other clinical requirements at the time of distribution or dispensing. Many clinical trials necessitate the need for cold temperature storage of the drug entities. We can manufacturer these labels with cryo adhesives that are specifically designed for these types of environments. 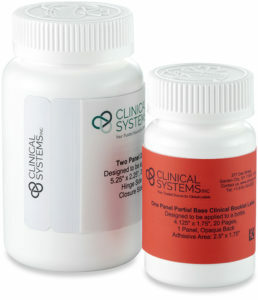 Clinical Booklet labels can be provided on rolls for automatic or hand application, or fanfolded. In each case, we label the roll or bundle with starting and ending variable data labels so that you know which label segment is contained on each unit of supply. Covers of booklets can be supplied with full cover tints to provide clinical differentiation of similar materials. Variable data can be printed on each label including randomization codes, lot information and dating as text or and as barcodes. 2-D and linear barcode symbologies can be implemented. For more information about our Products and Services, contact Clinical Systems today!